5 Bedrooms, 3 Baths. Up to 16 sleep in 5 kings +, or 15 singly. Hot Tub seats 7! The largest vacation home in the Historic Downtown area, Capitol Casa is located on a quiet residential street close to everything--less than a 5-minute walk to the Plaza and Canyon Road. Historic 1920's adobe home with fresh furnishings, fine linens, original art and neat antiques in cohesive, tasteful decor reflecting the region. Flexible rates enable small or large groups to afford this perfect location near the state Capitol. Flexible beds sleep 5 couples in king beds or 14 singles separately. 17 is the maximum. Families and friends love it! Private outdoor luxury hot tub. Walled garden and patio with tables and seating for 18. Featured in the May 2006 Old House Journal and the November 2008 Frommer's Budget Travel. You'll love walking 5 minutes (3/10 mile) down Old Santa Fe Trail to the historic Plaza, or 5 minutes over to Canyon Road; or strolling to museums, galleries, restaurants, sightseeing, shopping. Pop home to drop off your finds, and walk off to explore another area. Well-stocked market is just around the block. Ski 1/2 hour up the mountain, or take the kids to the playgrounds down the street. Come home and relax under the blue Santa Fe sky in the huge bubbling outdoor hot tub with waterfall, seats 7people . Gather for drinks on the big front porch and then walk to dinner at one of Santa Fe's many fine restaurants, or cook up a feast in the fully equipped kitchen. Barbecue on the gas and charcoal grills, and dine outside in the private walled garden or at the oak dining table which expands to seat large groups. The kitchen is fully equipped with spices, cooking utensils, many appliances, and service for 18. Complete bar glasses, tablecloths, napkins, place mats, and candles are provided, and you can set a lovely table with colorful china, placemats, napkins, table cloths and serving pieces. Built in the 1920's, the carefully updated adobe house is beautifully furnished with a tasteful mix of antiques, new top grain leather sofas, original art by New Mexico artists and Southwest artifacts. Richly colored Oriental rugs brighten the oak floors throughout. Hand plastered tinted walls and a big fireplace add ambiance. Firewood is supplied. Large open living room/dining room with three sofas, rocking chair, extending oak dining table. Enjoy elegant, luxurious hand-pressed fine 100% cotton sheets in 3-sheet systems, down and down-alternative pillows and pressed 100% cotton duvets on firm beds. Robes and plenty of fluffy 100% cotton towels supplied. Immaculate professional housekeeping satisfies even the most particular guests. Capitol Casa is approximately 2,600 square feet, plus the front porch with old-fashioned glider, antique bench, and patio chairs where groups can enjoy conversations outdoors. Flower gardens adorn the front and back yards. The walled garden patio has plenty of cushioned seating for up to 18, large sun umbrella, game tables, dining table under a huge shade tree, chiminea fire pot, morning sun and a view to the mountains. With a waterfall and a state-of-the-art low-chemical purifying process, the huge luxury outdoor hot tub has a cover lifter for easy access. Night lighting for evenings outdoors. The main level offers 3 bedrooms and 2 full bathrooms. On the lower level are two bedrooms that can be used for sleeping or dens, and a full bath. Everyone loves the double-sized large bedroom/den/viewing room with big screen TV with BLU-RAY DVD, VCR and CD/Stereo. Nicely separated from the main level bedrooms. Fully stocked laundry room. The house is well supplied to make your stay pleasant, with three stereos including bluetooth receiver, five cable TV's, music CDs, and a collection of movies made in Santa Fe. Free secure Wi-Fi. Laundry room has full size washer and dryer, hypo-allergenic detergent, iron, ironing boards, steamer. Dish and hand soaps, bath gel, lotions are provided. Toys, books, puzzles and games are supplied--remember Skittles? Take our basketballs to the hoops at the playgrounds in the next block, where kids can play on a variety of structures for all ages. Carport and off-street parking for 3 cars on-site, 3 more on the quiet street, plus more off-street at our office next door. Accommodations: 16 maximum, 17 if some are children. Fifteen singles can sleep separately: 12 singles in separate beds plus 1 more in the sleeper sofa and 2 in roll-away twins. Or 5 couples can sleep in 5 king beds in 5 separate rooms, plus a 6th couple in the queen sleeper in the living room. Professional housekeepers will set up the optional beds to meet your mix of couples and singles. 2 port-a-cribs. Should your group need more space, an elegant B & B right across the street has 5 rooms. 5 bedrooms, 3 full bathrooms. * Master bedroom: California King bed, en suite bathroom with double sink, jetted tub, and walk-in closet, T.V. Roll-away twin & port-a-crib will fit. * Second bedroom: California King bed, large windows, T.V., next to a bathroom with separate walk-in shower and tub, grab bars. Port-a-crib will fit. * Third bedroom: option of King or 2 Twin beds, French door to garden patio. * Fourth Large bedroom/den with two dressing areas in walk-in closets, cable big flat screen TV, Blue-ray DVD/VCR/Stereo, game table. Option of King or 2 Twins on one side, 4 more Twins used as daybeds on other side facing the TV. Option of 1 Roll-away Twin. 2 Pack N Play cribs. Door for privacy from small den. * Fifth bedroom/small den has option of King or 2 Twins. TV. Privacy curtain screens beds from door to third full bathroom. Port-a-crib fits. * Living Room: Queen sleep sofa. TV. All rooms meet code for firesafe egress, with doors or windows large enough and low enough for firemen to enter and for guests to exit safely in an emergency. Flashlights, fire extinguishers, smoke and carbon monoxide detectors are installed throughout the house. State-of-the-art self-condensing fully sealed heating and water system with no open pilot lights. Inspected and licensed by the Fire Department and City of Santa Fe. * Small or large groups welcome. Rates cover up to 8 people for small groups, with an additional charge of $35 per person per night for larger groups. Adults and children count. * Children welcome. High chair, 2 pack and play cribs, umbrella stroller, baby gate provided. Toys, games, books too. * Shorter bookings are accepted for infill year-round, or for adjacent bookings, or if close to arrival, or if minimum stay rate is paid. * $500 Exit Clean. Weekly clean required for multiple week stays. Maid Service is available by prior arrangement. * $500 Security/Damage Deposit, refundable if no damage, for up to 8 people. $1,000 Security/Damage Deposit, refundable if no damage, for groups of 9 or more. Cleaning fees higher than the prepaid exit clean will be deducted from the Security/Damage Deposit. * 15.4375% Tax. Required: 8.4375% NM Gross receipts tax and 7% Santa Fe Lodging tax. * Fully Remodeled daylight basement level has windows of correct size and height from the floor, meeting code for fire-safe egress. * Reservation deposit of 1/2 rent is due within one week of verbal reservation, paid by check or PayPal credit card for direct bookings. Balance due 60 days prior to arrival. * Cancellation policy: Confirmed reservations are considered binding. Refund if we are able to rebook the dates, less a $100 administration fee. Extenuating serious circumstances such as death or serious injury will be considered for refund or shifting dates. * Pets: Well-behaved dogs with our permission. Sorry, no cats. Pet fee of $100 per week or shorter stay. $500 pet damage deposit. * No Smoking and No Vaping in the house; smokers may use the covered front porch or back patio. Stay away from open doors and windows. 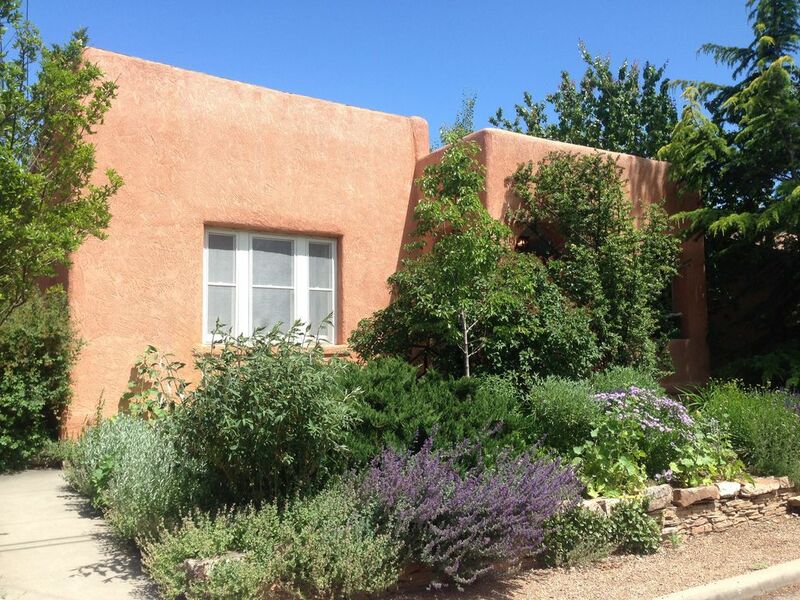 Owners Kristen and Steve Flance are long-time residents and active citizens of Santa Fe. Kristen spent 30 years with the state magazine, New Mexico Magazine, as the Santa Fe, Central and Northern New Mexico advertising representative, as well as doing interior decorating for high end resorts. Steve has volunteered for many community organizations including serving as Chairman of the Board of the New Mexico Finance Authority for 8 years, and has developed residential communities and resorts in Santa Fe for many years. We know New Mexico well and enjoy sharing our knowledge of Santa Fe and the state with our guests. We have another wonderful property, our lakefront home at Lake Tahoe (VRBO/1946). The great location downtown is unbeatable. When the house came on the market in 2002, we realized that we could personally manage it from our office right next door. The perfect location in the downtown core close to the Capitol, Plaza and Canyon Road, the legal commercial zoning, the house's large size and excellent condition, all make it a wonderful place for visitors to stay. Kristen furnished the home with original art, antiques, historic collectibles from Santa Fe and the Southwest that are appropriate to the age of the house which was built in 1924. Plenty of places to sit, firm beds with luxurious bedding, big expandable oak dining table, and the huge hot tub all make the home comfortable and fun for gatherings large or small. Everyone loves the downtown location and being able to walk back and forth from the house to restaurants and events, galleries and stores, and meetings at the State Capitol. Walk a block to Kaune's Market to pick up sandwiches and groceries and fine wine. With off-street and covered parking, plus more free parking on-street, you will be free from parking problems. The narrow, quiet street is just three blocks long--no traffic noise will disturb you. Fine art, tasteful furnishings, luxury amenities and immaculate housekeeping welcome you to this five-star home. toilet, combination tub/shower, tub, jetted tub, Twin sinks, walk-in closet, jetted tub/shower with grab bar. toilet, tub, shower, grab bars in walk-in shower, by toilet. Separate long tub. toilet, combination tub/shower, All cotton luxury towels provided. Luxury 100% cotton towels, hand and bath soap, bath gel, lotion, hair dryers, are provided--plus Robes and Cabana towels for the large outdoor hot tub! Perfect walk-everywhere location in downtown Santa Fe, quiet street just 3 blocks long--no traffic noise. 1/2 block to Capitol. 1 block to market. 3/10 mile, 5 minute walk to Plaza or Canyon Rd. See the Sangre de Cristo Mountains from the back patio. Local and long distance calls free. Air Conditioning and Ceiling Fans throughout main level. Lower level has air conditioning and standing fans. Fully sealed, state-of-the-art self-condensing natural gas central heating system provides hot water baseboard heating and instant on demand hot water throughout the house. No open pilot lights. Down & down alternative duvets and pillows, hand-pressed fine 100% cotton sheets in 3-sheet system. Hypo-allergenic detergent, fragrance free detergent. Robes. Laundry closet with hypo-allergenic fragrance-free detergent, spotter, iron, ironing board, steamer. Full size washing machine. Full size dryer in laundry closet. Plenty of parking! Park 1 car in carport and stack 2 behind it. Free on-street parking for 3 more cars to the north and 2 to the south of the driveway, on same side of the quiet street as the house. Plenty of luxurious 100% cotton towels--bath, hand, face--plus cabana towels and robes for the hot tub. Free. Throughout house. Bring your laptops. Living room with fireplace (firewood provided), tv/entertainment center in cabinet, plenty of seating including three sofas. Gas stove with self cleaning oven. Two automatic drip coffee makers, coffee filters, coffee grinder, coffee press. Spices, sugar, salt & pepper grinder, tea, oil, coffee filters, various other items. Paper towels, paper napkins, soaps, dish & dishwasher soap, laundry soap, fully equipped. Plenty of pretty dishes, place mats, napkins and serving ware to set and serve up to 18. Glassware for all types of drinks. Fully equipped kitchen for cooking and baking. Many small appliances, cooking tools, spices and sundries such as tea, sugar, olive oil, coffee filters. Large dining table has two leaves stored within it so the table can be extended to seat a big group. Additional drop leaf table can be opened for more seating to the 17 max or used for a buffet. 47 inch flat screen t.v in large den. T.V.s also in living room, master bedroom, front bedroom and small den. Stereo systems in large bedroom/den and in living room, plus a portable stereo/CD player. Bluetooth system in living room. Music cds provided. Living room and blu-ray in large den. Books for adults and children. Games, toys and puzzles in large den. CDs for children and classical to oldies for adults. Toys, games, puzzles, cards, poker chips in large den. Skittles game. Basketball for shooting hoops in the big school playground in the next block. Climbing structures and swings for all ages. Lots of videos and DVDs, many about or made in Santa Fe and the Southwest. Garden with many perennial flowering plants surrounds the house. Walled back patio and garden with shade trees, umbrella and chairs and dining tables for up to 18 people. Outdoor night lighting. Cool, covered, big front porch has glider, long bench, chairs and side tables. Seating for 10. Private back flagstone patio with flower garden, lots of seating, dining tables, grills, hot tub, umbrella, chimenea firepot. Huge shade tree. Outdoor lighting. Ski Santa Fe is a 30 minute drive from the house. Huge luxury hot tub seats 7, in private walled patio with garden. Multiple jets, including foot massage jets, waterfall and lights. Easy cover lifter. Outdoors under the blue sky and stars. Quiet residential neighborhood--no traffic noise! Our office is right next door, and our local staff offers immediate response to any problems and are available to answer questions. Playground in the next block, great market around the block. We use fragrance-free hypoallergenic laundry detergent. Soaps, shower gel, bath salts and detergent supplied. Paper towels, toilet paper, spices, coffee filters, many such sundries supplied. Down & down-free pillows and duvets, luxury 100% cotton sheets and towels. Dens with good separation perfect for kids. Games/toys/puzzles/books. Massage therapist will come to house. Attentive professional cleaning crew keeps the house immaculate. Great location. Great communication. Very well equipped. We had a great time. A group of 8 women celebrating our 70th birthdays this year had a wonderful time at Capitol Casa. We have all stayed at many places and never encountered a place more generously equipped with loads of towels, dishes etc. Each of us having their own bed was important for us. Great living area seating for group conversation and within walking distance of everything in town. Will stay there again! The home was perfect for a large group and had everything you could possibly need. It was the perfect location and a breeze to walk to great restaurants, galleries, etc... Will definitely stay there again if travels bring me back to Santa Fe! My family of 9 had a fantastic stay at Capitol Casa. The house had everything we needed and made it easy to figure things out- lights, thermostats, hot tub were all a breeze. The room layout downstairs was interesting, but the perfect place to put the young kids and baby in the group to run around. The rest of the rooms are well appointed, with ample blankets and comfortable beds. My favorite small touch was the number of towels available, there is no way to ever run out. The house is also perfectly situated near downtown, a short walk away. Kakawa Chocolate house is also super close if you need a hot chocolate. Enjoy! Recently returned from a 5-night stay with a group of 9 women friends who first bonded in 1967. This is an amazing find! Capitol Casa is perfectly located, just a few blocks from the Plaza and downtown shops and museums, all within easy walking distance. As the name denotes, it is only a few feet—across Paseo de Peralta—from the state Capitol (the “Roundhouse”), with its magnificent art collection, which is free and open to visitors. Just a block away there is a drug store, coffee shop and Kaune’s Market, which is small and a bit upscale, but fine for picking up something you may have forgotten at Trader Joe’s or La Montañita (co-op) both within easy driving distance. The Saturday Farmers Market is also within walking distance, and I wish we had been able to shop there, but we were off to Ghost Ranch and Abiquiu that day. The house itself is beautifully furnished, homey and has ample room for a group. We occupied four bedrooms, hung out at the large dining table and living room, and shared the use of the 3 full baths. There were enough beds for several more. The mattresses were excellent and linens of high quality. The kitchen was very well-supplied with quality cutlery, ceramics, and pots and pans. There were numerous small touches that made us all smile. Kristen (owner) and Debbie (manager) were highly responsive and very kind as we readjusted our numbers several times, modifying the contract each time to accommodate us. On our last day there, as we were discussing our next gathering place in the US or Canada, several of us felt that we would love to come back to Santa Fe to stay at Capitol Casa for a second time. We knew that we had only scratched the surface of all that the area has to offer, and we will be back! Thank you for a memorable stay in a wonderful small city rich in culture, history, and natural beauty. The house and our stay was great! They think of everything that you could possibly need. If we get a large group back to Santa Fe again, we'll definitely try to stay here! Within very close walking distance are the historic Santa Fe Plaza (3/10 mile), State Capitol, Canyon Road, San Miguel Mission and the oldest church, Loretto Chapel with its miraculous staircase, Santa Fe's downtown with many fine restaurants, galleries and stores for Santa Fe's famous shopping, museums, galleries, historic sites, cultural attractions, visitors center for tourist information, playgrounds, grocery store and coffee house. Drive to golf, skiing, Indian Pueblos, prehistoric ruins, and the many scenic attractions throughout beautiful Northern New Mexico. Base rate is $500 for up to 8 people: Extra people above the first 8 are $35 per night per person + $5.41 tax = $40.41 per per person per night. Pet damage deposit: $500. Pet fee $100 per stay. Dogs only, by prior approval. Exit clean: $500 per stay or week. Thanksgiving: $700 per night, $4,000 week, for up to 8 people, plus $40 per person per night for 9 and more people. 5 night minimum. Christmas, New Years weeks rate: $850 nt, $5950 week for up to 8 people, plus $40 per person per night for 9 and more people. 7 night minimum each week. Damage deposit is $500 per week for up to 8 people. Large groups of 9 or more, damage deposit is $1,000.